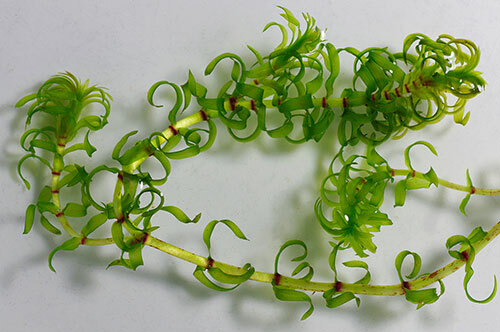 Elodea is a submerged aquatic plant with herbaceous stems, submerged leaves and floating flowers. It spreads mainly vegetatively, which means that tiny fragments of the plant are enough to start growing in a new place if light, nutrients and space is available. Elodea is known for its quick growth and its ability to compromise the water quality of lakes and creeks as well as severely impacting native fisheries. 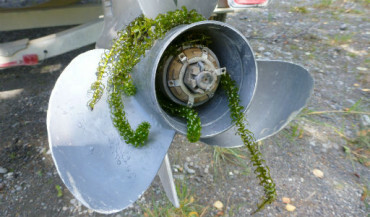 In places where this plant has established it makes boat and floatplane traffic very difficult. Elodea is a major concern for landowners on infested lakes or creeks since the value of their property could be reduced. Never release foreign water, plants or animals into the wild. Elodea is commonly introduced to a waterbody when people dump unwanted aquariums into the water. To prevent the spread of any invasive plants or animals, clean and dry ALL of your gear and equipment before leaving a site (waders, boats propellers, trailers, floatplanes, fishing gear, etc.). Also, be aware of the plants you are planting as many invasive plants are introduced through landscaping and gardening. If you notice an unusual plant or animal, note the location, take a picture & call the Invasive Species Hotline: 1-877-INVASIV (1-877-468-2748). 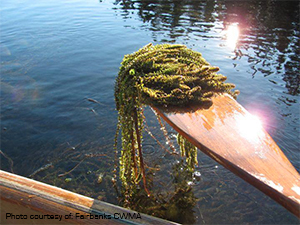 Elodea is commonly transported from one water body to another by boats and float planes.